It would be Forelle Müllerin if I hadn’t overheard a discussion about (wild) wood sorrel yesterday while in the Bodhitree stall in Union Square. Almost before I had entered the conversation, the customer talking to Nevia No and who was holding the last bunch in her hand, placed it in mine, and generously offered it to me. I had already purchased two rainbow trout from Dave of Max Creek Hatchery; I knew this was going to be a match made in Greenmarket heaven. It was, and I thank you good woman. Last night the cress stood in for the traditional parsley finish in this classic German dish. 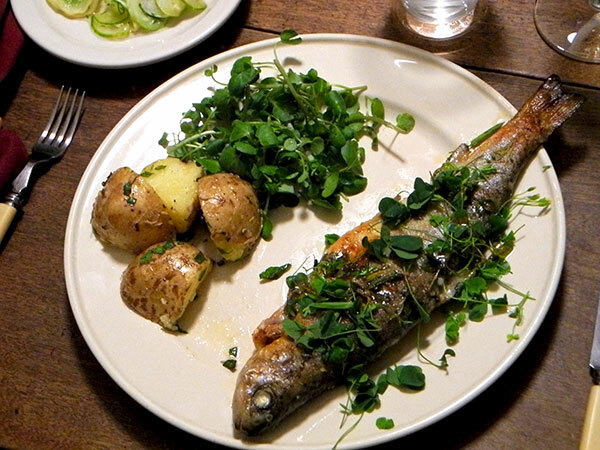 The rest of the meal included Saltzkartoffeln, made with new Yukon Gold potatoes from Berried Treasures, finished with chopped lovage from Keith’s Farm; and a serving of lemon-and-oil-dressed wild cress (wilde Brunnenkresse), again from Max Creek. I had salted and pressed a variety of thinly-sliced cucumbers from Lani’s Farm late in the afternoon. After I had rinsed and drained them I added a few slices of shallots and some chopped dill (from SSO Farm), chopped parsley (excellent parsley from Eckerton Hill Farm), and a bit of sugar, before covering everything with a mixture of good vinegar and water. This side dish/salad was a pretty good semblance of what my mother served, and she had learned it from her mother, who had learned it from her Frankish mother, who had learned it from her mother, born in 1814. Barring the shallots substituting for a sweet onion, I think I served a pretty German Gurkensalat. Our spell of heat and humidity broke last evening, blessedly. Before it did I spent time, more than I want to admit to, wracking my brain and a number of recipe files and books for ideas on cooking flounder which did not involve using the oven. I also wanted to do something other than what I often have done, even though it’s delicious. I had brought home a beautiful fillet from PE&DD at the Greenmarket earlier in the day, and I was thinking it wouldn’t really be a proper summer feast if the windows were closed. Further to a consideration of recipes, I was becoming a little concerned about my growing – and ripening – tomato hoard, so I definitely wanted to include some of the fruit with the fish. The solution I came up with was a slight reworking of a recipe I found on line (never underestimate the internet’s usefulness in the kitchen, no matter how large your recipe file may be). It was described as “Petrale sole with tomato butter” on the LA Times site, but I wasn’t scared off by the fact that my bottom feeder didn’t come from the Pacific, or by the absence of tarragon in my electric larder. I love tarragon, but fortunately I did have some lovage, from Eckerton Hill Farm; it’s one of my favorite seasonal herbs, one which I regularly use any excuse to add to a dish. I also substituted for the cherry tomatoes mentioned in the recipe two ripe heirloom tomatoes from Norwich Meadows Farm, which I chopped, perhaps into pieces a little too small. Meanwhile I had also been seduced while at the market by some beautiful and delicious Roma beans being offered by Race Farm. I sampled them raw and they were really flavorful – actually complex in flavor! I’ve often been disappointed by the taste and texture of Roma beans, so I asked the farmer why these were so extraordinary. He told me they picked them while young (the beans). It seems it works. 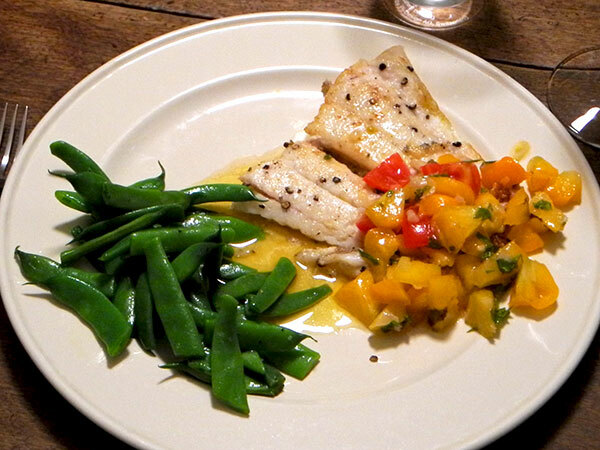 I wasn’t certain how good the fish recipe would be, but I decided that the colors, on the same plate with the bright green of the beans, would look pretty terrific. In fact the entire entrée turned out to be really, really good, far more delicious than I could have imagined; I think most of the credit should go to the freshness of all the ingredients, and the restraint of the recipes: The fish was simply seasoned and sautéed, the beans par-boiled, rinsed, dried, and warmed a bit with oil and butter just before the fish went into the pan. The salsa was the only relatively complex element, although not from the standpoint of preparation, since it could also be assembled somewhat at leisure, before the beans were heated and the fish cooked. I cannot lie. We turned the AC on last night, although only in the kitchen and breakfast room. Earlier in the day I had been seduced by some fish and vegetables spotted in the Greenmarket, but by evening, when I was beginning to think about what I was going to do with them, the thermometer was still sitting in the high 80s in the area around our 1931 Magic Chef (like this one, but with a bit more elegance). That was before I had even started making dinner; I was pretty certain it wasn’t going to drop while I worked up a proper meal, each element of which called for at least some range heat. The fish I brought home were four 3-ounce small sea bass fillets from Blue Moon Fish. This is how beautiful they look before cooking. I sprinkled the four with a light coating of seasoned flower, and dipped them in an egg which had been beaten with chopped parsley. After a quick sauté in a mixture of oil and butter, I removed them from the pan, sprinkled them with a bit of lemon, finishing them with pan juices I had mixed with some more parsley. 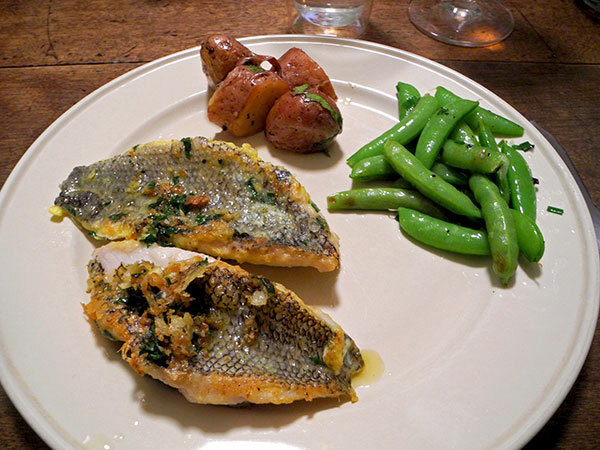 The accompaniments were large red fingerlings from Lucky Dog Farm, which I boiled, cut into smaller pieces then tossed with butter and lovage; and sugar snap peas from Eckerton Hill Farm, blanched for one minute, then briefly heated in a little oil and finished with chives. Each of the herbs also came from the Greenmarket, the parsley from Queens County Farm, the lovage from Mountain Sweet Berry Farm, and the chives from S.S.&O. Farm. The wine was an excellent Loire, Olga Raffault Cuvée Chinon rosé 2012, the gift of wonderful friends. This might be considered an almost perfect entrée for a hot day. While delicious served cool, as it should be, the pasta itself of course has to be boiled. It can, and in fact it must be done long before it’s combined with the rest of the ingredients. That means only the cook has to suffer a hot kitchen, and those fiery duties can be accomplished hours before anyone sits down at the table. It’s Pasta Promfumata al Limone, or ‘lemon-scented pasta’. Here it’s Afeltra fusilli con buco, combined with shredded carrots (perversely, in my interpretation, white carrots from S.S.&O. Farm, since they are what I had on hand, although parti-colored carrots would have been spectacular), shredded tuna, garlic, lemon juice and zest, parsley, basil and lovage (my addition). 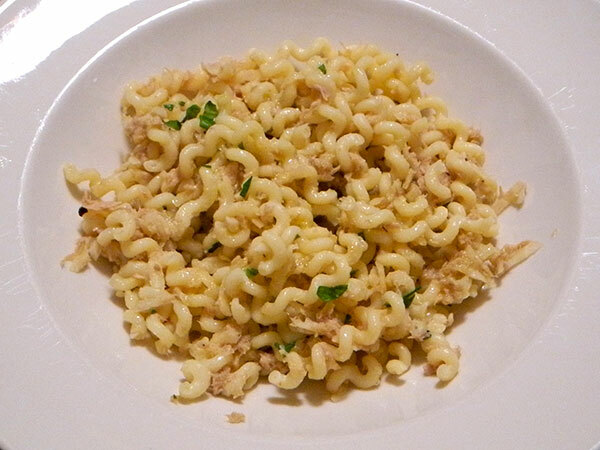 I substituted the fusilli for the recipe-specified farfalle or ‘bowties’, because I did not have the latter in my, . 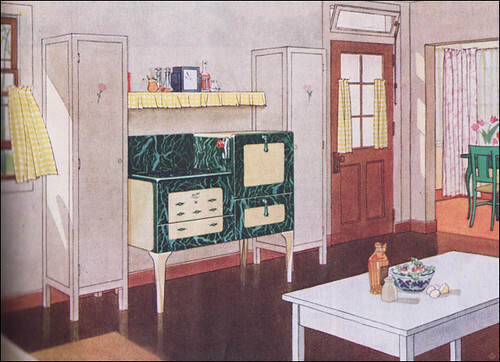 . . larder. Note: Only when I began to mix the cooled pasta in with the remaining, refrigerated ingredients did I realize that it would have been better to use almost anything but a long pasta; penne would have worked fine. Next time. The recipe is from the late, much-missed Kyle Phillips, writing in ItalianFood years ago. Yes, by now it should be clear that we spent the Fourth of July in our summer place on 23rd Street, where we almost always holiday. In the first two of the three days of the extended weekend we had a meal dominated by fish (a pretty American meal, even if, since it was in a particularly New England form, it was somewhat esoteric American). Dinner on the second day included grilled red meat (a feast almost, but not quite of the classic American cookout sort, since lamb still doesn’t conjure up thoughts of the typical American barbecue, and because it was enjoyed indoors). On the third day we had a simple picnic, but once again we probably missed the point of the genuine Fourth, since this picnic was indoors. Also, there was no chicken. I had decided to work with the warm weather, meaning I would avoid cooking altogether, so I assembled what we call a picnic, something we do on occasion to vary the kitchen routine and to enjoy an even more leisurely pace, whether before, during, or after dinner, than I can normally arrange. 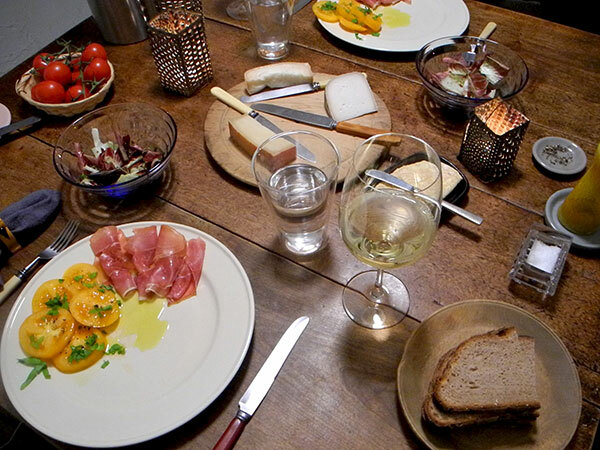 All of the food was gathered from what we already had on hand, making the meal even more relaxed. There was prosciutto (packaged, from Whole Foods, and honestly quite good); sliced yellow tomatoes from Stokes Farm, topped with Mountain Sweet Berry Farm lovage; a small simply-dressed salad (treviso from Queens County Farm, topped with chives from S & SO Produce Farms); four cheeses (Paglierino and Salva Cremasco from Eataly, Willoughby of Cellars at Jasper Hill from the New Amsterdam Market, and Garrotxa from Citarella); and an Italian rye bread from Eataly. Oh, and those red tomatoes? They were only table decor this time.